I am rooting for spacedev's efforts so hard I may just have to buy stock in the company. You have the main asteroid belt out between Mars and Jupiter, and the minor asteroid belt between Earth and Mars. Scientists believe that there are approximately 100 million objects in the minor asteroid belt. It's known that 25 percent of those are energetically the easiest bodies to get to in the solar system. They're energetically easier to get to than the moon, even though the moon is two and a half days away and the asteroids are weeks and months away. Energy equals money. Then there's more good news: Scientists believe and hope that approximately 20 percent of those 100 million objects may be dormant comets. That means there may be 20 million deposits of water in orbits around the sun between the earth and Mars. Well, 20 percent of 25 percent of 100 million translates into 5 million deposits of water that are the easiest things to get to in the solar system. Water is hydrogen and oxygen, and that’s rocket fuel. Decades ago, science-fiction author Robert Heinlein said that when we get to Earth orbit we’re halfway to anywhere. What he meant was that the amount of energy to get us to Earth orbit is equal to the amount of energy needed to get us anywhere else in the solar system from Earth orbit. The problem we have today is that once we get to Earth orbit, our tanks are empty — and it requires a huge effort to get beyond Earth orbit, and that's why very few missions go out into to deep space. If you had a railroad tanker car full of water in Earth orbit, that would be 100 tons of water. People recognize that it costs $5,000 to $10,000 per pound to get anything off the surface of the earth into orbit. That means lifting that amount of water into Earth orbit would cost $1 billion to $2 billion. If you were able to send a robotic drill and extraction device to one of the easiest and cheapest of the 5 million deposits of water, and bring back that much water back to Earth orbit, using the water itself as propellant, you'd wind up with an asset in low Earth orbit worth $1 billion to $2 billion. Now we'd have a filling station. We can refuel our tanks, and we can open up the rest of the solar system. That's the killer app. More specifically, the killer app is solar thermal water propulsion. That means taking something as simple as mirrors in space — where the solar energy is intense — simply reflecting that intense sunlight onto a little heat exchanger, squirting water from a big bag through the heat exchanger, flashing it to superheated steam out the nozzle in the back, and off you go. That is what we refer to at SpaceDev as an elegantly simple solution. Elegant simplicity is what's going to open up space, and solar thermal water propulsion is elegantly simple. It goes out and brings back the very substance that is life support in its essence, water. And liquid water is also rocket propulsion. There are 5 million deposits of water out there, that are the easiest things to get to in the solar system. Why in the world are we looking at deep dark craters at the south pole of the moon that are operating at nearly absolute zero? There's no sunlight down there. There's no energy down there. Even if there's water, it's more like a frost mixed in with frozen dust, sand and gravel. How are you going to mine it, extract it and put it to use? It's ludicrous, especially when we've got 5 million deposits of water that is 50 to 80 percent pure. ...I call dormant comets and water in space "white gold," as opposed to the black gold that allowed the modern industrial society to exist as it does today. I just saw the missing data (the rectangles in this image) and thought of 2001 (not just the movie... but what actually happened in the real year 2001). . And also thought: Isn't the sun beautiful? Isn't it amazing how we can heliograph so many different ways now? Later on, while catching a bit of that sun, I had a nagging suspicion that I'd mis-used the word heliography, thinking: "Helio" (meaning sun) and "graphy" (as in geography). Sure enough, I had. I'd meant to express "the study of the Sun")... but the word meant: photography! And I wondered: Did Sol have to wait until 1826 for someone to take a picture of it? I found another site preserving heliography as "the art of using mirrors for communications" . Heliography is alive and well - and means all these things at the same time! Just look at how we can capture the sun today. The Doc endorses Scanning them all! - and so do I. Every book, every publication, everything ever published - should be on the Internet. Only by doing this will our collective IQ increase to sustainable levels. We need a new library of Alexandria to survive the coming century. Clicking around from home I am always awed by how far the Net has come... and then I go stand inside a magnificent library, like that of UC Santa Cruz - and weep - because 99.99% of the information contained in that single multi-story building - is not on the internet yet. I note that your attempt to railroad the "Paid Political Internet Splogging Act" through the House was just defeated. If you truly favor free internet speech, well, Denny, open up comments on your blog! Can't you do that? Or is there some sort of franking rule that would prevent an open dialog of this sort? If so - don't you think that's more of a problem than freeing paid political bloggers from FEC requirements? Thank you very much for contacting my office about an issue that I know concerns you greatly. Please note that this is an auto-reply to acknowledge that your email message has been received. If you are a resident of the 14th Congressional District of Illinois, your position/views expressed in your message will be logged and if requested you will be receiving a response. For those residing outside of the 14th Congressional District of Illinois, your position/views expressed in your message will be logged. At this time, due to Congressional franking privileges I am only able to respond to residents of the 14th Congressional District of Illinois. I would encourage you to also contact your Representative directly to express your views. You may do so by visiting http://www.house.gov/writerep/ and entering your zip code. Two last things for today, then back to my build. the egregious MPAA strikes again. I am no advocate of domestic terrorism, but I could understand how despicable actions like this could persuade some people that the entire regime is so corrupt that it ought to be brought down in blood. The actions of those who subvert the law to their own profit are rarely so visible and so contemptuously flouted as this. There cannot be one ethical person in the chain of commands from the top of the MPAA to the paralegals who assist in this activity: they are not only wrong, but they must know they are wrong. Ah well, we will not have people's courts in this land. If we did, comes the revolution, comrades, I know where their headquarters is. Thank you for blogging about the Online Freedom of Speech Act. If you'd put up a link to the proposed bill's text - and invite others in the blogosphere to comment... you might prove to me that you're "getting it", and might actually be fit to legislate in this matter. I mean, this particular bill is kind of short, and I would hope that the typical blogging taxpayer might be able to read and understand what this bill is really about. Bloggers don't all suffer from news attention deficit disorder. The report shows that of the 32 states (and the District of Columbia) that are "winners" -- receiving more in federal spending than they pay in federal taxes -- 76% are Red States that voted for George Bush in 2000. 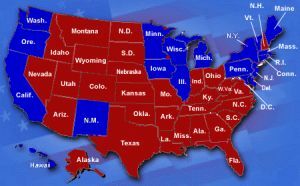 Indeed, 17 of the 20 (85%) states receiving the most federal spending per dollar of federal taxes paid are Red States. Personal outlays increased $169 billion (7.7 percent) in the third quarter, compared with an increase of $146.6 billion (6.8 percent) in the second. The personal savings rate -- saving as a percentage of disposable personal income -- decreased from 0.1 percent in the second quarter to a negative 1.1 percent in the third. This means that Americans on average in the third quarter actually dipped into their already accumulated savings instead of placing more money into their accounts.